He keeps his finicky 25-year-old Mack gravel truck parked nearby, where he can keep an eye on it through the living room window. He drove the truck, by his own estimate, one and a quarter million miles. Even as plants poke up around its chassis, it seems the truck —not the blues or the house — is the thing that matters to him. After Claud won his court battle in 1998 and was recognized as the son of blues music legend Robert Johnson, his lawyer handed him a six-figure cashier's check and begged him to quit hauling gravel. Claud kept hauling gravel for five months. "After 29 years, it just gets in your blood," said Claud, whose smile reveals glinting gold dental work. "I wake up some mornings, I want to get on that truck." 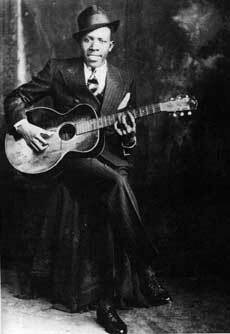 Robert Johnson was a brilliant blues guitarist, singer and songwriter. 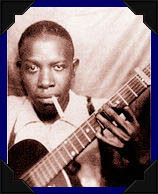 His short life is a landmark in blues history. Disgusted with drudgery of fieldwork, he left his sharecropping family around 1930 and took to the highway, recording, in his unearthly voice, 29 songs. Johnson's music was so good, other men said, that his talent could not be natural: Delta legend has it that one day at a backcountry crossroad, Johnson waited for the devil to come by. After that, Johnson could play any song he wanted, but he had surrendered his soul. Johnson was just 27 when he died in August 1938 — poisoned, most people believe, by a jealous husband in the Three Forks Store, a Greenwood (Missippipi) juke joint. He was so poor and unloved, it is said, that his body was dumped into the ground without a coffin, and to this day, no one is entirely sure where he's buried. But the brooding songs he wrote and recorded have been discovered and rediscovered by the generations that came after him. People in Greenwood have become accustomed to the Japanese tourists who come looking for Johnson's grave. Recently, Rock and Roll Hall of Famer Eric Clapton released "Me and Mr. Johnson," a CD devoted entirely to Johnson's blues. Popular covers of his songs have been recorded by Led Zeppelin, The Rolling Stones, Elmore James, The Red Hot Chilli Peppers, and many, many others. 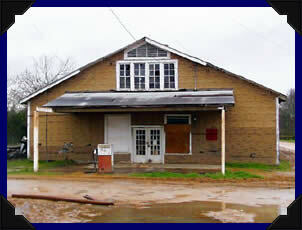 The Chicago blues master Muddy Waters said that the only time he actually saw Robert Johnson play was on the front porch of Hirsberg's Drugstore in Friars Point, Mississippi (pictured right). A crowd of people had gathered around Johnson, who was playing ferociously. As Waters describes it, he became intimidated by the older man's incredible musicianship and quickly left the scene. 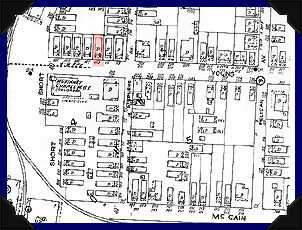 Below is the Sanborn Fire Insurance Map of Greenwood, Mississippi, which depicts the shotgun house at 109 Young Street in which (according to bluesman David "Honeyboy" Edwards) Robert Johnson died in poverty. That house has been torn down and another currently occupies its place. One of Robert Johnson's graves is behind the Payne Chapel Missionary Baptist Church in Quito, Mississippi. The stone was erected in 1991, though there is some dispute whether Johnson is buried here or in Morgan City. The Mt. Zion Missionary Baptist Church near Morgan City maintains the Robert Johnson Memorial, which was donated by Columbia Records. 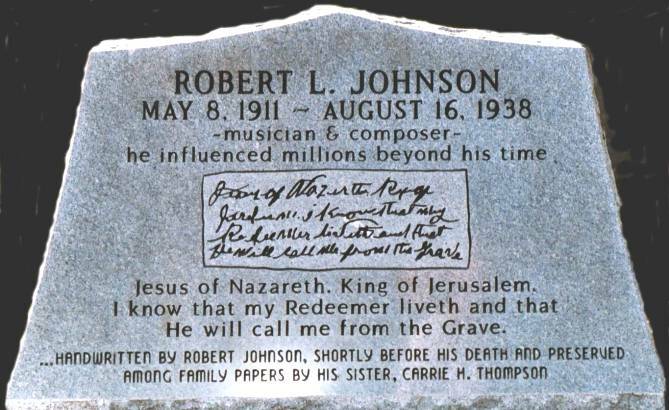 According to Johnson's death certificate, he's buried in the Mt. Zion graveyard. However, "Honeyboy" Edwards, who was with Johnson when he died, claims that Johnson's sister moved his remains to the nearby Payne Chapel Missionary Baptist Church in Quito. 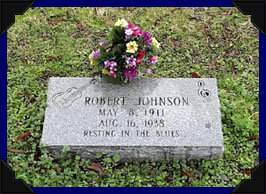 Morgan City, Mississipi, 1991 : the dedication of blues master Robert Johnson's gravemarker. It puts Johnson's music in context with its varied audiences, from the original fans in the juke joints, to the listeners who heard blues songs long after their creation, from record buyers and audiences in clubs, through to the work of enthnomusicologists and his influence on other music greats such as Eric Clapton. 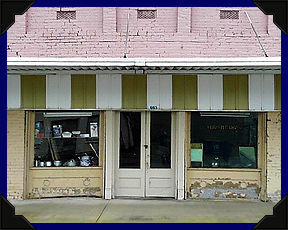 (Above left) The Three Forks Store, where a jealous husband reportedly poisoned Robert Johnson, has since been moved to this location beside Highway 7. View "Me & the Devil Blues" here. View "Up Jumped the Devil" here .